Every marketer has two problems. First, we want people to visit our website. And second, we are responsible for turning that traffic into quality sales leads who will become paying customers. We’ve thrown everything at these problems, from paid ads to viral ploys that make no sense, and still the problem lingers on. But – one company found an innovative solution to solving these problems. Let me tell you their story. 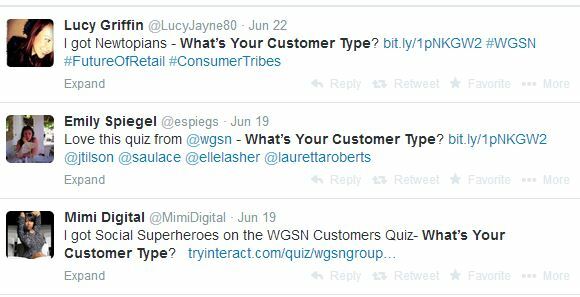 On June 19th, 2014, Worth Global Style network, a fashion forecasting business, set up a quiz titled “What’s Your Customer Type?” The online quiz was eight questions long and was designed to lead quiz takers to discover what kind of customers they had. It was a fun quiz, but a simple one. One week after publishing the quiz, it had seen 1527 views and collected 258 new email subscribers – and the only promotion that was done for it was to share on Facebook and Twitter a couple of times. 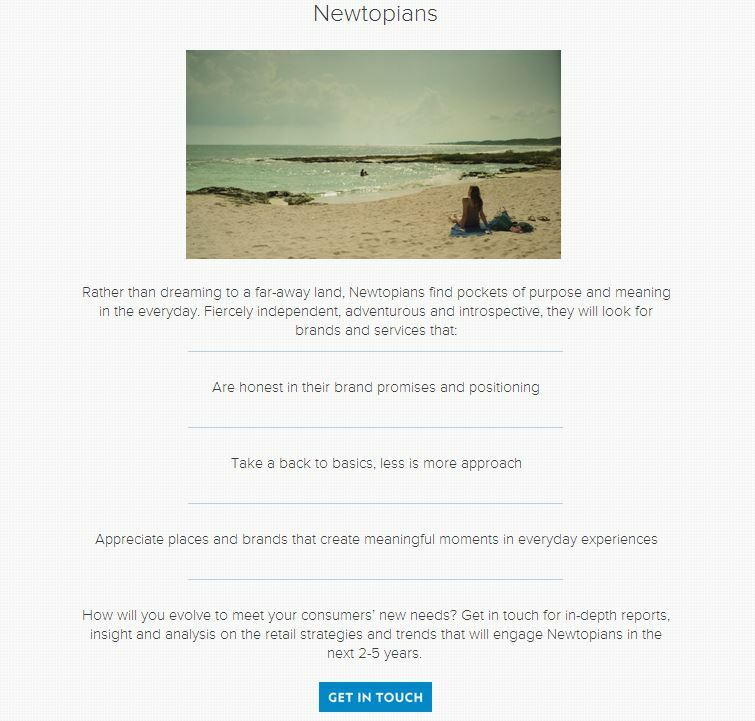 Quizzes have the potential to both drive traffic and grow your email list to promote long-term relationships. This unique blend makes quizzes a form of content that kills two birds with one proverbial stone. In this article I will dissect what makes a good quiz, using the Worth Global Style Network as an example. Are you ready to make an awesome quiz? Let’s get started. The first step in designing your quiz is to come up with a great title. Your title alone can account for 80% of a potential visitors’ decision to take your quiz or not. Here are a three types of titles we’ve seen work very well for quizzes. “What’s your _________?” This is the one the Worth Global Style Network chose to use. This title is effective because it can be applied to any industry, and it makes people get introspective for a second and think about what they really are. An “Actually” title, as in “Do know who your customers actually are?” This title is really just a knowledge assessment wrapped in a challenge. When we are presented with a challenge like this, it actually causes a fight or flight response to happen. Usually people err on the side of fight, which is one of the most powerful reactions you can elicit. “Which celebrities are your customers most like?” The whole concept of a personality quiz is strong in and of itself, but wrap it in some pop culture and you’ve got a winner. We like celebrities in part because they allow us to escape from our own lives. Using celebrities in your quiz capitalizes on this by directly comparing your readers to famous people. Now that you’ve got a great headline, it’s time to come up with the actual questions on your quiz. The questions of in your quiz are an opportunity to create some rapport with web visitors without ever speaking to them in person. Here are three ways to create rapport in a short amount of time. Use your personality as an advantage. You don’t have to get all crazy and start speaking in Ebonics, but throw a little pizzazz into your quiz questions. Speaking with personality will help create a connection with every person who takes your quiz. The Worth Global Style Network does a good job of this by speaking candidly in their quiz questions, as you can see in the example below. The optimal quiz has nine questions. This is enough time to build some conversation (about two minutes to complete), but not so long to where people start getting bored. Over-complicating your quiz questions will remind people of the quizzes they had to take in school – and no one wants to be reminded of those quizzes. People like things they understand, so keeping your quiz simple will endear you to every reader – even if it’s just a little bit. 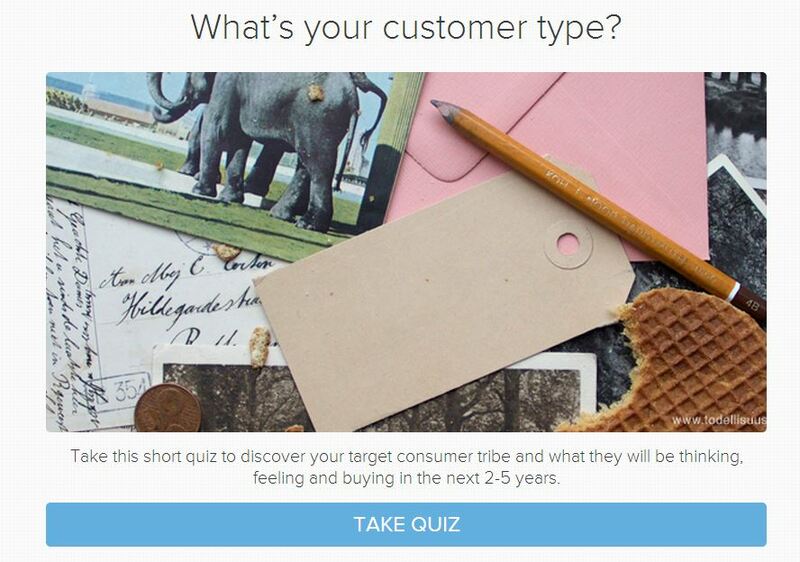 Quizzes boast an average 50% opt-in rate across a sample set of 1000. They can be an amazing way to simultaneously entertain and get new subscribers. If you want your online quizzes to be close to that 50%, be sure to follow these tips for the best results. Have a call to action that’s relevant. The beauty of lead generation within quizzes is that you can make the call to action pertain to the quiz questions that come right before it. For the Worth Global Style Network, that meant having a call to action that talks about getting advice on customer profiling. Be sure to offer a trade. Lead generation – the art of asking someone to join your email list – is a trade. You need to be offering something of value in return for the quiz takers’ contact information, or else it’s not a fair trade. Be up front about what you’ll be sending. Don’t trick people into subscribing for one thing, and then send something else. 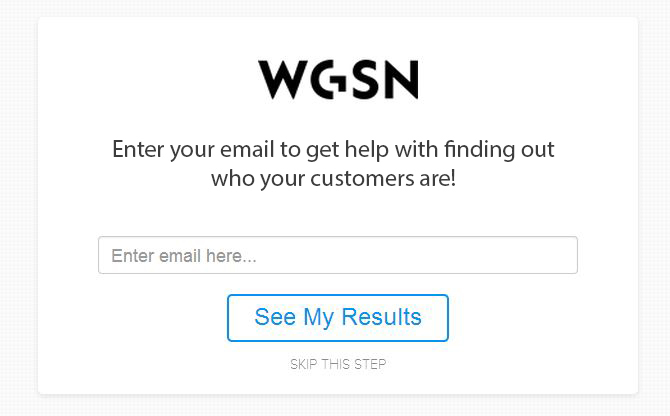 Be honest about what you’ll be sending.Worth Global Style Network does this well: they promise to send tips on finding out who your customers are, and that’s exactly what they send to new subscribers. Now that you’ve designed several great online quizzes, it’s time to amplify the reach of your quiz through sharing. Make your quiz results share-able and your success will grow with each new person who takes your quiz. Here’s how you accomplish that. Each quiz result is very nearly its own landing page where you can present your pitch to a quiz taker. You’ll need a headline, a short description, and a call to action based on the type of result that’s being presented. Check out how the Worth Global Style Network did it. Prepare for sharing. People will share your quiz (if you make it interesting enough). And that’s really all there is to designing great online quizzes: a headline, fun questions, a way to turn your quiz takers into email subscribers, and a way to get your quiz shared with even more new people. Now, let’s look at three ways in which you could use your awesome quiz to advance your business goals. Faequeir County Virginia has a population of 60,000 residents. This presented a problem for the local paper, Faequeir Now, which was looking for creative ways to take their publication online. 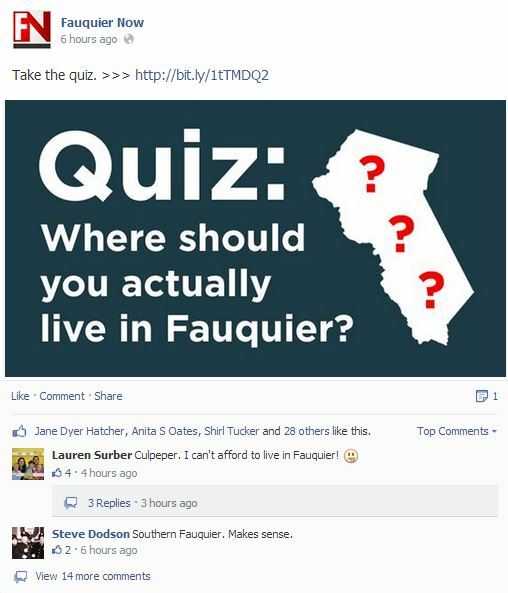 So they created a quiz called “Which Part of Faequier County Do You Belong In?” After two days, 10,000 of the county’s residents had taken the quiz. That means one in every six people in the county took a quiz created just for fun. The quiz sparked an ongoing debate on Facebook, with people questioning or agreeing with their results. It was a smashing success for a local paper taking its content online. Quizzes can provide very valuable information about who is visiting your website. By looking at how the questions are answered, you’ll have valuable data to use as a base for creating future content – blog posts, white papers, free reports, webinars, and more. After a few thousand people took the quiz, a clear winner emerged. For most companies, trust was an extremely important value. In the future, the company who designed this quiz can use this feedback to write content about how to create a trustworthy brand, how to have trustworthy design, and a whole plethora of a trust articles. Quizzes can be used to help your E-Commerce customers find just the right product for their personal interests. By crafting questions that lead to a result which contains a product, you can increase sales. A great example of this is Fuel Plus, a Canadian company that sells seven different kinds of protein powder. They created a quiz to help potential customers find the right kind for them. The result was a conversion rate of 10%, with 100 of the 1000 quiz takers going on to purchase protein powder. Quizzes are a fun form of content, but they also provide value by driving social awareness, generating leads, and even pushing E-commerce sales. Although there’s a standard, effective outline for good quizzes (headline, questions, lead generation, social sharing), you’d be surprised at how few people use online quizzes in their online business. All you have to do is adapt it to your industry and go create your own quiz! 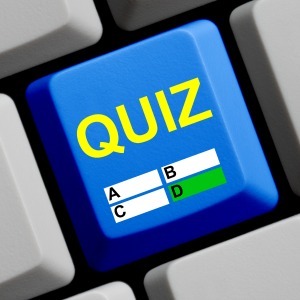 Do you currently use quizzes in your online business? Of so, what tips or tricks would you add to this article? And if not – what type of quiz would work well for your business? Let me know in the comments below! You are so right! Celebrity quizzes are an awesome way to provide more personalized post topics based on how your quiz respondents classify themselves. Love this idea as a catchy and useful way to grow a following. I am wondering, what technology do you use to calculate the results (i.e. 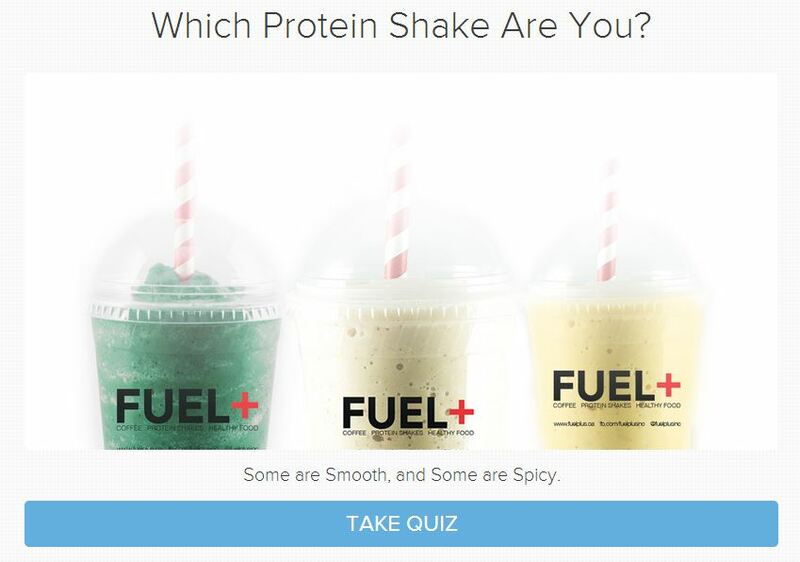 work out which celebrity they are most like, or which protein shake they are)? Is there an easy way to se this up? I hate these “what type of celebrity are you” quizzes 😀 Yet they get so many social shares for some reason. Thanks Josh. Very insightful – I do have a quiz but not many nibbles from it. After reading your article I can now see where & why it’s fallen a little flat. I need to add some spark to it. Some of the seeming “nuances” of a quiz can really be the difference between falling flat and getting traffic, I’d encourage you to give it another go! Thanks Douglas! Quizzes can be very effective when done right and pretty much useless when done wrong, glad to hear you’re having success! I really like your article on the usage of quizzes to build your business and look forward to using the concept. Thank you.